Urban Decay's Deluxe Shadow Box is currently on sale for $16 at the Urban Decay website, where I picked up mine. I think this is a GREAT price for this many shadows; it's cheaper than a drugstore brand at this price! I've been wanting to try out this brand for a long time, so I went a little bit crazy and bought several of their palettes. I'm trying out this one first, because Spring is just around the corner, and this one has lots of bright colors! The package is a magnetized, suede covered, cardboard box. The shiny stuff on the front is a metal mesh that slinks around a little bit. I am not a fan of cardboard/paper containers. I would like this a lot more if the box were metal or plastic. The eyeshadows are in metal pans. It comes with a little tube of Primer Potion, two sponge applicators, and nine eyeshadows. As for the sponge applicators, I'll probably never use them. I use brushes for my eyeshadow, and haven't used a sponge since I learned how to use brushes. Besides that, they would just make the palette messy, and the space for them isn't wide enough for them to lay side by side so they would touch each other, muddying up the colors. I suppose it would make sense to wash them after each application, but then they'd never be in the box anyway (use, then wash, then leave out to air dry... would you really put them back in the box at night, or just leave them out on their drying spot?). I would have rather gotten a larger primer potion with a deeper well to store it within the palette. The little primer potion bottle they give with it doesn't fit in the palette anywhere. Aren't the colors pretty? I almost didn't get this palette because of the blue, and to a lesser extent, the green. I don't ever wear those colors. Then, I thought, you silly goose, surely some of your lovely readers wear those colors, so let's live a little and try something different! But, I still didn't try those two right away. Old fears die hard, I suppose, and I've never previously managed to get blue or green to look right... or maybe it just didn't feel comfortable... but in any case, it was new territory. So first, I tried out a smokey pink and purple eye, and I only used shadows contained within the palette. The colors went on smoothly, but I noticed that they went on better if I loaded up my brush and put down one thick layer, rather than trying to build the color up. There was very little fallout, even with the brush loaded with shadow. I used Scratch above the crease to the eyebrow, Fishnet at the inner corner, then lightly blend where they meet. Next, put Ransom in the center lid and lightly blend it where it meets Fishnet. I used the same brush without cleaning it at these steps. Using a different brush, put Zero on the outer corner and lower lash line. I also put down a thin line of Urban Decay's 24/7 Eyeliner pencil in Zero on the top lashline. Then use that brush to blend the eyeshadow Zero in a sideways V-shape until it is smoked, then start blending where it meets Ransom. Finally, using the brush that you blended Zero into Ransom, smudge out the lower lashline. 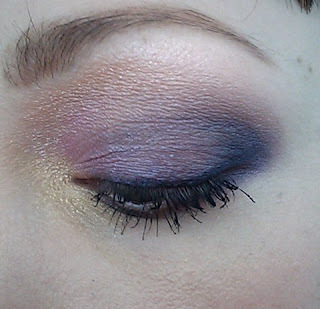 The Ransom in the brush from blending the lid will give just a hint of purple at the lower lash line. Make sure to smudge the entire lower lid, gently fading the color out. To do that, concentrate on smudging the lash line, and just occasionally sweep the brush lower. You can sweep once, see how dark it became, and then sweep again. Honey was used in the inner corner area to brighten the look up. I think it ended up looking like a soft tropical sunset. 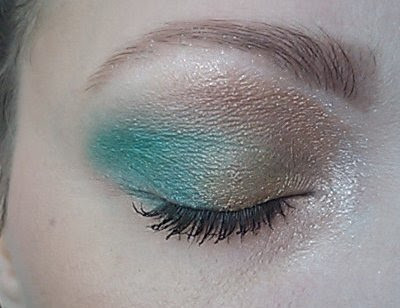 Well, that's four colors left of the nine to try, so I tried out a look emphasizing this Spring's trend color, green. In this case, Graffiti. 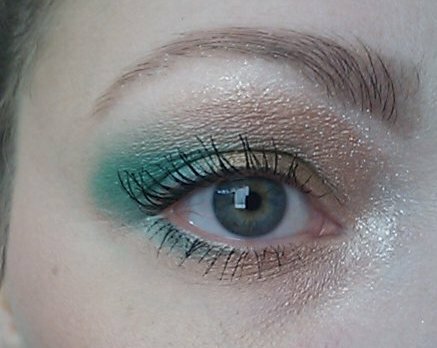 Like I said earlier, I've never really worn a lot of green eyeshadow. I tried it back when I first started wearing purple, and it just didn't look right to me. I looked at the colors in the palette that were left, and realized that they follow my eye coloration. At my pupil, my eyes are a pure hazel, then there is a ring of yellow, and then it goes to a green/blue/grey with occasional deep hazel spots. So, leaving out the spots part, I decided to do browns at the inner corner, fading out to green over a layer of blue, fading to pure green, with a pat of yellow in the center of each eyelid. To be more specific, I used Shag in a wide sideways W, from under the brow, to the crease, to the lash line. Then I filled in the spaces between with Underground. After that I did a slight V from the crease, pointing to the outer corner, and slanting back to the lashline, with Peace. Finally, I put Graffiti at the outer corner and lower lashline. Then I started blending Shag and Underground together, swooping the color to the inner corner and to the mid-lower lashline, under Graffiti at the lower lashline, fading to the outer edge with whatever was left on the brush. Then I slightly blended Peace to Underground, then blended Graffiti to Peace until very blended, occasionally swooping along the lower lashline where I had previously applied Graffiti. Finally, I used my finger to add a pat of Honey to the center of the upper lid. I did use a pure white, ultra-shimmery eyeshadow at my inner crease and brow-bone. The colors were looking very Autumn-like, instead of Spring-like, so I felt it needed more light brought to the look. 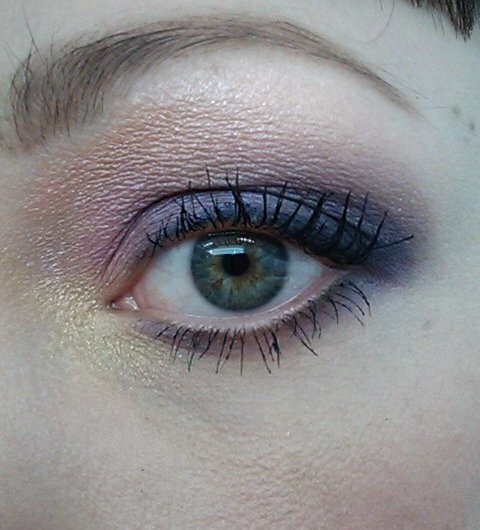 There isn't a white or otherwise light highlighting color in the palette, other than Honey, so I had to use an eyeshadow out of my collection. The colors stayed bright and true all day, and as the day went on, I became more accustomed to seeing green on myself, and started to like it. It certainly catches attention, so be prepared for commentary, although the comments I received were positive. It did make me a bit self-conscious to get comments about it, but I think it's just an unusual look for where I live. To sum up, I really like this palette. I think it is a good, and cheap, introduction to their eyeshadows. You get four bright colors, and four more conservative shades, so it's not a one-trick-pony kind of purchase. I just ordered this palette as well! The looks you did look great! I think the green & gold look fabulous with your green eyes. I hope you're still trying out those colors regularly!